It’s that time of year again! 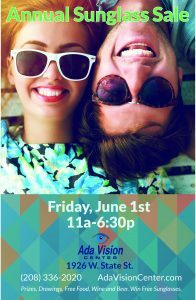 Come join us for our Sunglass Sale, June 1st 2018 11am-6:30pm. All Sunglasses will be 20-50% off! While you are checking out the newest fashion sunglasses, enjoy desserts and refreshments. We will have over 450 styles of sunglasses on hand with additional styles from our many frame representatives. Our representatives from Keanon, Lafont Paris and Modo will be here to show you their newest products. During this event, our sunglass frames will be discounted 20% to 50%! Prescription sunglass lenses will be discounted 20%. Sunglass brands on display include: Oakley, Maui Jim, Ray Ban, Ray Ban Jr., Vuarnet, Kaenon, Nike, Dragon, Modo, Calvin Klein, Roy Robson, BrillenEyes, Ovvo, Polaroid, Invu, Nine West Etnia Barcelona, Xavier Garcia, Lafont, Baby Banz and many more.